National Greyhound Adoption Program and Dutton Road Veterinary Clinic started out with one mission; to adopt as many greyhounds as we could and be their voice. When Kate was brought to us we had known that she was an extraordinary rescue case. As we look back over the past 28 years when we began adopting greyhounds, for a short period of time we simply first met the people at the airport as the dogs came off the plane and said "here′s your greyhound." For approximately the last 10 years National Greyhound Adoption Program has taken in handicapped students from Philadelphia Academy Charter High School's Transition Program to do a variety of helpful tasks during the school year. On Saturday, April 1 current West Virginia house approved legislation previously passed by senate to end subsidized racing. Volunteer drivers arrived Sunday morning, March 25, to load 31 new greys destined for NGAP. In our efforts to continuously improve safety in surgery, we have installed and will have a ventilator in routine operation to help regulate the oxygen level in your pet's body during surgery. You may not recognize the people in this picture, but they are in fact NGAP Director David Wolf, Jon Wolf; his son, and I.M. Original. This photograph was taken in the early 1990s, when Jim Fritz, the gentleman to my left, from Fritz Kennels was one of those people supplying us with greyhounds for adoption. 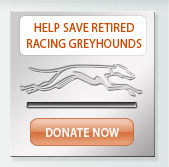 National Greyhound Adoption Program is fortunate that many groups donate their time to help us in many ways. Today, as I pulled into the driveway, a transport from Wheels 4 Paws Recue was waiting for me to get loaded with lots of NGAP food to hull back to South Carolina. I recently attended a convention held by Grey2K bringing greyhound advocates from around the world to Del Rey Beach, Florida. This conference was held October 15, 2016, Grey2K hosted a one day seminar to address the efforts across the globe to end greyhound racing. At last something for loud noises, thunderstorms, and fireworks. 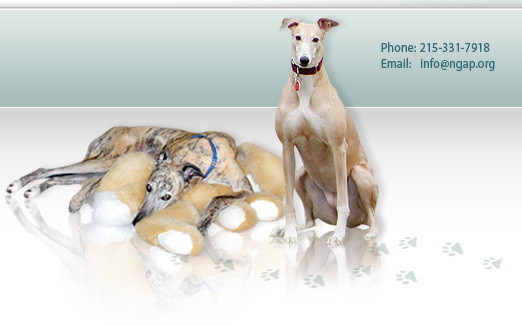 For those of you who don't know, Hemopet is a presumably non-profit animal blood bank holding 200 greyhounds in California run by Dr. Dodds and her husband Charles Berman. Over the years much has been said about the 13 Galgo puppies and their wonderful mom, Love/Stella renamed by her adopters, Mary Lou and Jack. 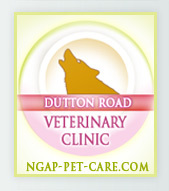 It's fortunate in having an in-house veterinary clinic known as Dutton Road Veterinary Clinic. NGAP recently purchased what is unquestionably the best trailer rig in the US for all greyhounds. Who Has a Billboard on I-95? Extended Clinic Hours to Better Serve You! Dutton Road Veterinary Clinic, an affiliate of National Greyhound Adoption Program, will be phasing in more night and weekend hours to better serve our clients! This story is complex in that it involved many people that ultimately loved these foreign, yet American-born, galgos. Adopting A Greyhound Puppy: Oh My! After 25 years of being involved with greyhound adoption, I'm sure you can imagine that I have seen my share of greyhound puppies along the way. For those that are not aware, National Greyhound Adoption Program/Dutton Road Veterinary Clinic has its own crematory. While it is rare that we ever have to cremate any of our in-house dogs, we cremate cats and dogs belonging to our clinic clients on a daily basis. This year the State of Florida had the opportunity to pass two important measures that would help greyhounds during their 60-day legislative session which was set to end on April 30th. One bill would have permitted decoupling which would allow tracks losing money on live racing to end it but continue other forms of gaming. The other would require injury reporting at Florida greyhound racetracks to make the industry more transparent and let everyone know what is actually going on at Florida's tracks. I am aware that almost every large city in Australia has a greyhound racetrack. The sport retains a combination of breeders and trainers from backyard to professional. I was very pleased to see that a few organizations popped up in Australia several years ago to deal with greyhound adoption and advocacy. Even so, when you look at the number of greyhounds running compared to those being adopted, the killing must be astronomical. Almost everyone that reads this already knows how special greyhounds are and how much they change our lives. Everyone has their own story of greyhound love and addiction and whenevr we can, we try to pass those stories on to you. This is a story about Caroline and Ray Gutierrez. Two Azawakhs, West African sighthounds, visited our clinic recently for treatment. Since neither the doctor nor I had ever seen one before, we chatted about these greyhound-ish looking hounds with their owners. One of our adopters who has participated in the Susan B. Komen 3-Day, has organized a 'Pinkhound' cheering section and photo-op area along the walk route. Any greyhound owners wishing to participate are encouraged to dress their hounds in pink and join the fun. It sounds like 'greyt' fun! National Greyhound Adoption Program volunteers are presently selling Boscov's shopping passes to raise money for our organization through Boscov's Friends Helping Friends promotion. The cost of each shopping pass is $5.00 and the entire amount goes directly to NGAP. Passes can be used at any participating Boscov's on the Tuesday, October 21st, 2014 from 9:00AM until 11:00PM to receive up to 25% off your purchases, including sale items (all particulars are clearly stated on each pass). Running For Greyhounds is holding a bowling event at Saint Monica Lanes in Philadelphia, PA to raise money for the greyhounds of National Greyhound Adoption Program. Most people are not aware, but National Greyhound Adoption Program takes part in Philadelphia Academy Charter School's Transition Program. Each week the school brings between one and four students with Autism Spectrum Disorder, Cerebral Palsy, Turrets Syndrome and other conditions to our office to perform a variety of tasks such as paper shredding, photo scanning, wall painting and dog walking. March 13th is a birthday celebration of sorts in the Wolf household. Some of our older adopters might remember that in January of 2004, NGAP brought several galgos to the United States from Spain. As it turned out, one of those galgos, named Love, was pregnant. We decided to let her continue with the pregnancy and on March 13th, Love gave birth to 13 galgo puppies! On Monday, February 24, 2014, the Florida Senate Committee on Gaming presented Senate Bill 7052 for passage, which deals with every aspect of the Florida Pari-mutuel industry. This 453-page bill seems to bring up every subject except decoupling. Right now in Florida there is legislation pending to 'decouple' greyhound racing. What does this mean in real terms? To break it down simply, in Florida, the licensing of other forms of gaming at Florida's racetracks, such as slot machines and card games, are tightly tied to greyhound racing. Many large breed dogs do not have problems with bladder stones and as a non-veterinarian I am assuming that this may be because it is easier for stones to pass in large breed dogs since the passageways are larger. Breeds that are susceptible to bladder stones are mini schnauzers, dalmatians, shih-tzus, dachshunds and bulldogs. Bladder and urethral stones may be large or small, single or multiple, and may pass spontaneously or potentially obstruct the urinary tract. Stones in the bladder may also make it very painful for the animal to urinate as well cause blood in the urine. 22 New Greyhounds at NGAP! On December 21, 2013, 22 new greyhounds arrived at National Greyhound Adoption Program from Daytona Beach, Florida. Join us for NGAP's Annual Holiday Sale! Twenty-four years ago, give or take a few years, we screen printed our first t-shirt to promote greyhound adoption. The t-shirt was probably a second and the idea for the print probably came out of desperation. It was a simple message, 'No Excuses, Adopt A Greyhound'. Click below to see Grey2K's campaign video and sign a petition to end dog racing! On Sunday, September 29, 2013, National Greyhound Adoption Program will be holding its annual picnic. Bring your greyhounds and see what's new! Good Luck, Sam & Gay Latimer! Mr. & Mrs. Latimer have informed us that they are retiring and will no longer be doing adoptions through National Greyhound Adoption Program. We would like to thank them for their continued support and hard work over the years in helping to place hundreds of NGAP greyhounds in the Virginia Beach area. Thanks for this greyt video from Ferd and Beverly Sebastian! July 4th just passed and my two storm-phobic hounds, one galgo and one Italian greyhound dealt with the fireworks superbly. If found a solution, it was certainly by accident, but only time will tell. This 4th we chose not to use any medications and no thundershirts. Having trouble finding your dog in the yard at night? Worried that drivers won't see you and your pet on nightly walks? Try NGAP's new Reflect-A-Pet Safety Bands! On Saturday, April 27, 2013, Melissa Markee, daughter of NGAP adopter Dawn Markee, hosted a craft table at a flea market sponsored by New Foundations Charter School. Up until this winter we never had an occasion or place to go where our dogs could be off-lead and roaming freely inside a large enclosed dog park with 30-40 other dogs. See what our Student Externs have to say! NGAP's NEW Website Site Search! Check out our new Google Site Search feature on www.NGAP.org. Type in a keyword or keywords to take you directly to the articles and information you are seeking! For all of those attending Greyhounds In Gettysburg, Dr. Aime Berman, Medical Director and staff veterinarian at National Greyhound Adoption Program/Dutton Road Veterinary Clinic, will be available on Saturday from 10am-5pm to answer any of your greyhound health questions and offer advice on issues you may be expeiencing. This is a free service courtesy of National Greyhound Adoption Program. Please stop by and visit our booth! National Greyhound Adoption Program's pet clinic, Dutton Road Veterinary Clinic, is now offering a wonderful new pet identification card for all clients and new greyhound adopters. This card contains a photo of your pet with your pet's name, your name and contact information, our clinic name, hours and contact information, and your pet's medical history. This way you will always know when your pet's shots need to be updated and how to contact us to schedule your appointment! Dr. Phil Zeltzman is a traveling or mobile board-certified veterinary surgeon that performs specialty surgeries at NGAP's non-profit pet clinic, Dutton Road Veterinary Clinic. He is available to perform specialized orthopedic, neurologic, cancer and soft tissue surgery on dogs and cats at Dutton Road Veterinary Facility for a fraction of the cost that you might be asked to pay at a veterinary specialty facility. Dr. Phil Zeltzman performed his first two surgeries, both Femoral Head Ostectomies, at National Greyhound Adoption Program on December 5, 2012. The purpose of this procedure is to correct a deficiency in the hip. The ball joint is removed to enable a pet to walk and run without a limp. At NGAP, we always like to relate good news (for us!) as it relates to the greyhound racing industry. Look who just arrived at NGAP!!! Our unique externship will be an exciting opportunity for 3rd and 4th year veterinary students interested in practicing excellent medicine and surgery. There are many opportunities to work with our in house greyhounds and to work with the general public both with greyhounds and non-greyhound dogs and cats. It's hard to imagine that there are some parts of the world where greyhounds have it worse than they have it here in the United States. Macau is one of them. Many dogs from Australia end up on the peninsula of Macau at the Canidrome where they don't have a chance at life during or after racing. In 1995 Tom took his family cat to his local veterinarian. While there, he picked up a brochure for the National Greyhound Adoption Program, fell in love with the idea of a greyhound and decided he should adopt one. Photos of greyhounds in our gingerbread house submitted by their owners. It's that time of year again! Please join us for our annual Holiday Sale! A listing of new articles published on this website during October 2012. Taking care of your dog's nails whether it be a greyhound or other breed is important to the health of their feet and their general well-being. Greyhounds and other pets, as they get older, will often have internal organ failures that go undiagnosed and cause their health to decline possibly resulting in death. The vet may never truly know why, the client may never know why and the costs of continued diagnostic testing can become prohibitive. If you look at early photos of our new kennel on our website, you will note that our kennel entrance included four mature oak trees in the runs. Although we had hoped they would thrive despite our construction of the sand runs, it was not to be. The information presented below is not meant to be technical, but rather informative to a non-veterinarian reader. The intent is to present photographs of both normal and abnormal organs. Additional photos will be added. On October 17, 2011, we were presented with a 10-year-old male greyhound who had just been seen at the University of Pennsylvania to have a test done. The test did not require an anesthesia protocol whatsoever but, due to anxiety, the dogs temperature rose to over 103Â°. Our facility sees well over a thousand greyhounds each year under anesthesia protocol and have, in turn, seen many galgos, or Spanish greyhounds. Over the years, we have found that galgos have a significantly slower recovery time from anesthesia than greyhounds under the same anesthesia protocol, under similar conditions and having similar surgeries. Inconsistent Eating: What do I do? There are multiple reasons why dogs don't eat. Sometimes we just spoil them rotten and they will hold out for the delicious treats as opposed to their kibble but aside from this, there are also a variety of very medically technical reasons why dogs don't eat. Since I am not a veterinarian, we won't deal with those issues in this article. This article provides potential solutions to the problem. They may not work on every dog, but they do work! National Greyhound Adoption Program has been utilizing the laser to treat greyhounds' mouths for many years. With the opening of our Dutton Road Veterinary Clinic, we now use our methods on other breeds of dogs and cats as well. On April 12, 2011 we did an exploratory surgery on Tizzy. Her history indicated that she had been losing weight for several months although she was eating regularly. An ultrasound indicated a 12-15cm mass. The adopters had a choice of paying $3000-$4000 to euthanize their greyhound at a specialty facility or paying $1500 at National Greyhound Adoption Program to perform an exploratory. It was a fairly typical day at the Dutton Road Veterinary Clinic. Dr. Mahesh Patel, one of our staff veterinarians, had some free time so he began a spay procedure on Faith. Faith was a 4 1/2- year-old greyhound available for adoption at our facility. Many players from The Holy Cross High School Football Team from Delran, NJ volunteer to walk the greyhounds on Sunday mornings throughout the year accompanied by their coach, Mr. Frank Holmes, and his family. As a result of their interest in the National Greyhound Adoption Program, they recently participated in the "1st Annual Lancer Nation Bench-A-Thon" held at Holy Cross High School in August as part of their team service project. New concrete runs for our greyhounds are coming, one run at a time! You and your greyhound(s) are invited to join us on Sunday, September 16, 2012 from 12 noon to 4 pm! PLEASE READ! Updates to boarding rates and policy changes. Most of us take our greyhounds for walks, some of our dogs love other dogs and a few may actually hate other dogs. In most cases, greyhounds will have an affinity to other greyhounds and will not be aggressive to them. You can usually count on that. If your dog is the exception to the rule, it should always be wearing a muzzle. The story below is true. Could it have been avoided? I'm not sure, but in retrospect, steps should always be taken if this situation occurs. We get many calls from adopters experiencing separation anxiety issues with their new greyhounds in the first few weeks they are in their new home. This is the first time their greyhound has ever been separated from the pack and they may be going into a home with no other dogs where sometimes no one is home for up to 8 hours a day! Because of this, they're not quite sure what to do with themselves. Some dogs will go to sleep and wait for you to come home, but others...may not. Due to the arrival of 33 new greyhounds at National Greyhound Adoption Program, there will be a temporary boarding freeze in effect from June 14th, 2012 until July 18, 2012. The Lexus Project, based in New York, often gives pro bono legal defense for greyhounds and other canines that have gotten a raw deal. Recently, they took up cause for Buddy, a Golden Retriever. Buddy had gotten loose from his owner's home in Connecticut and gotten into a scuffle with several other loose dogs at the beach. A person intervened and was bitten by one of the dogs and although it could not be confirmed that he actually did it, Buddy took the wrap. Fortunately, the Dutton Road veterinary Clinic of National Greyhound Adoption Program continues to expand and we continually find it necessary to increase the hours our veterinarians are working. In previous years, our former doctors worked a combined total of 25-32 hours per week. Currently, our schedule calls for 86 hours. Listed below is the current ad that we are running for veterinarians. Spread the word! We have heard in the past that this high dose thyroid supplementtation will be adverse to the long-term health of your dog. With all of the years we have been using thyroid supp with has been ever increasing over the years, we have not seen tht to be the case. It is the belief of this writer that quality of life issues will supercede almost anything unless there is some immediate detrimental affect from this supplementation and we know that not to be true. For about two years, National Greyhound Adoption Program has had a dedicated group of volunteers manning the boarding office on the weekends during walking hours. They greet visitors and dog walkers and answer general questions about adoption and the clinic. These volunteers have been a great help to our kennel staff who are busy taking care of the dogs. Watch this greyt video about NGAP! This video is based on an interview with David Wolf, Director of National Greyhound Adoption Program, by Candice Monhollan, a Journalism student from Temple University. At 11 years of age, Leader has the distinction of being in the NGAP kennel longer than any other greyhound currently at NGAP. Although his behavior is too unpredictable for us to safely adopt out into a home, Leader is doted on and spoiled here on a daily basis by staff members and volunteers and gets lots and lots of walks, attention and love. NGAP's little group of South Jersey Volunteers keeps active pretty much year 'round promoting greyhound adoption and raising funds for NGAP, not to mention getting together for weekly lunches! 2011 was no exception. On February 3, 2012, 34 new greyhounds arrived at National Greyhound Adoption Program from Daytona Beach, Florida! Photos and profiles should be on our website within the next few weeks. On December 22, 2011, Houdini, our very last Animal Medical Center blood donor dog left this world. He was born in August of 1998 and was the first to be born in his litter. We don't know exactly how long Houdini served as a blood donor at the Animal Medical Center but we know he was there during my first visit to the AMC in 2004. All of the greyhounds were there for much too long. December 3rd & 4th, 12 noon - 4pm! Greyhounds and Their Owners Are Invited to Attend!!! Dasher was in to visit us about a year ago. At the time he was 13 and he truly looked like he was ready to die. He was limping, although we could not see anything abnormal on x-ray. We certainly didn't expect that he would live much longer. Judy Gitel recently sent me a copy of her illustrated story for children about Mercury, her adopted greyhound that brought so much joy to her life. Just Another NGAP Meet & Greet? Not really! Long-time volunteers,Eileen and Michael Saks, organized yet another successful Meet & Greet at Redner's Market on behalf of the National Greyhound Adoption Program. Eileen, Mike, Caroline Vogt and Lisa Fritz handed out flyers to patrons as they entered the store which listed the things that we use each and every day. This is the second such event for NGAP and just like last time, it paid off! We assume that everyone loves their greyhound and wishes only the best for them. But if you let your dog get to the point where it has significant root exposure on its upper or lower canines, your dog will be in pain all the time and it will suffer endlessly - possibly until it dies from something else. Check out NGAP's new advertisement running at Tiffany's Diner in Northeast Philadelphia! Effective August 1, 2011, an additional $5.00 service charge will be added per dog, per day, for all greyhounds over 11-years-old. Thanks to Josh Cherry and fellow Boy Scouts from Troop 130, NGAP now has beautiful walking paths in the woods surrounding our kennel facility. The NGAP Clinic is Open for Business! Our beautiful high-tech clinic is finally up and running! Appointments are presently being taken for Tuesdays, Wednesdays and Thursdays. Please call 215.331.7918 to schedule your appointment today! On Wednesday, April 4, 2011, a very special Italian greyhound left this earth. Our sales representative from Intervet Schering-Plough suggested we carry a tick collar which they have been selling widely in Europe for several years and just released in the United States. We wouldn't agree to sell it to our adopters until we first tested it out on some of our own greyhounds. April has been a busy month here at NGAP. We have just received 17 new greyhounds from Alabama and 31 new greyhounds from Florida! Thumper Becomes a Sports Booster! Russell, a volunteer from Philadelphia Academy Charter School, has been volunteering at National Greyhound Adoption Program for a few years now and has a great affinity for our dogs. Upon request from PACS, we decided that Thumper, one of our senior greyhounds, could be a mascot for their school! We currently have two dogs in kidney failure that are being treated at National Greyhound Adoption Program. Thanks to the substantial efforts put forth by their caregivers, both of these dogs are thriving, although we certainly do not know for how long. To look at them, you would never think they had a problem. Everyday seems to be a good day for them! Enter now to win Phillies tickets! Drawing June 3, 2011! OraVet Wants Pictures of Your Smiling Pet! Merial, maker of OraVet, is looking for America's healthiest pet smiles to promote pet dental health. Upload a picture of your pet's smile to HealthyPetSmiles.com and submit it to the OraVet Healthy Pet Smiles Contest! WOW!!! We have a really greyt raffle prize this time around - an iPad 2! Tickets are now available at the NGAP Office, Kennel and Clinic as well as by clicking the link above! This is a really neat prize worth 500. We expect to sell approximately 500 tickets, so the odds are fantastic! It's a very neat prize that anyone can use. We have more little critters! We just received six adorable Italian Greyhounds, lovable and affectionate from Italian Greyhound Rescue Association. Recently, NGAP was presented with a non-greyhound that had significant growths all over its body. This was an excellent opportunity to show what one of our lasers can do! We always have a blast at this bowling event, and friends, neighbors and family are always willing to help out a sponsored bowler with a donation pledge. Even if you're unable to attend, you can sponsor another bowler. Bowling fee per bowler is $10.00 (includes shoe rental, if needed), and the opportunity to go home with some nice gifts as a thank-you for your support. On very short notice, Fox gave National Greyhound Adoption Program a small window to talk about the new dogs that have just arrived from Daytona Beach, FL. For the 20th year, National Greyhound Adoption Program has attended the North American Veterinary Conference. This year, NGAP held a raffle for a digital camera that was donated by Director, David Wolf. It's not just this time of the year, but all year round. Who could imagine walking through a kennel with 80 dogs in it - they have all been out for their morning exercise, they have all just gotten a meal, employees are taking a break - with only just a hush in the air! In the past two weeks, we had two situations where greyhounds appeared to have small cuts on the surface of their skin when actually the cut went very deep into the flesh. Greyhounds will usually only bleed for a few minutes unless a blood vessel has been severed and although the bleeding may stop, you could potentially have a small wound with much more significant damage under the skin. Many times an injured dog will find a ways to open sutures your vet spent so much time (as well as your dollars) doing or will lick it's wounds profusely, sometimes causing infection or irritation. One of the quickest, easiest and most effective ways to thwart this behavior is to make a towel collar. Periodontal Health EFAC is a new product that I just recently learned about at this year's North American Veterinary Conference. Many greyhounds may miss a meal from time to time, or even a whole day of eating. If you are worried about it, you need to do something about it! Normally the first teeth that have to be extracted in a greyhound's mouth will be the upper molars and premolars. Today, December 13, 2010, NGAP received a really big surprise! Welcome to our Holiday Sale on Saturday December 4 and Sunday December 5, 2010 at Noon - 4pm. New store opening, new items for sale, more coats for your greys, sports raffle and more! We received a call from John DiLeonardo, an NGAP adopter, who had adopted Bambi from us approximately 10 years ago and wanted to return her to us at the age of 12 years 4 months old (born July of 1998). Recently, a greyhound seen at another facility died after a routine corn removal and much associated pain and stress. They also used drugs that we do not use here. In analyzing what went wrong, it is my belief that the entire incident could potentially have been avoided if the adopter, seeing that her dog was in discomfort and distress once it returned home, had been instructed to take her dog's temperature. At this point, everyone should notice a pattern in the descriptions of those greyhounds that get lost. The first word I always see is 'shy'. In the case of Tangerine, who is currently lost, 'wary of strangers' fills the bill, 'do not chase' fills the bill, 'spooky' fills the bill. 50 people attended our Chicago Grill fundraiser on October 24, 2010. October 16, 2010 marked the one-year-anniversary of moving from 4800 Wingate Street to our new kennel facility at 10901 Dutton Road. National Greyhound Adoption Program is actively seeking competent, motivated and friendly veterinarians to join our staff. This photo has to go back to the early 90's. It just kind of turned up when we were doing some cleaning. The photo depicts Jim Fritz, Gay Latimer and myself at the Fritz Kennels in Hollywood, Florida. Those of you that have followed the construction of our new kennel know that there are cameras almost everywhere - and no, we do not have secret cameras in the bathrooms! From afar, whether it be from the Director's home or literally from any computer anywhere in the world, we can look and see what is going on at the NGAP kennel. Redner's Market - What A Greyt Idea! On Sunday, September 12, 2010, Mike and Eileen Saks staged a Meet & Greet outside of Redner's Market in Levittown, PA. But this was no normal Meet & Greet! Redner's permitted the Saks' to hand out flyers to their shoppers as they entered the store. On the flyers was a list of suggested items that shoppers could purchase and then donate to our organization. National Greyhound Adoption Program has been adopting greyhounds for twenty years now. Many of these greyhounds have been successfully placed with families with small children even though most of them have just come from a racing facility and are not used to little ones crawling around or walking up to them. If you are a griller and want to bring hot dogs, sliders, wings, kabobs, etc., we will have our gas grill available for you to use..
NEW! - NGAP Greyhound Wall Monthly Calendar Coming Soon! All of us are sweltering now but it was not so long ago that big time snow was upon us! Effective June 24, 2010, there will be a $15.00 surcharge on all boarding reservations made less than one week in advance. In your greyhound's lifetime, you may encounter several instances in which it is appropriate to force feed your greyhound. Most greyhounds will permit you to force feed them. Rick Tarquinio is a name that few of you may recognize. We first acquired a cassette tape he had cut back in 1993 or thereaboputs which included a song called Run For Your Lives. Run For Your Lives is a song that tells the story of greyhounds that ran at the Belmont, New Hampshire Greyhound Track. Please be sure to watch David Wolf and Lisa Fritz talk about greyhounds and greyhound adoption with Steve Highsmith on PHL 17s 'In Focus'! Tyler came to see us in clinic on Tuesday, May 25. He was not feeling well, had an elevated temperature, and had a benign growth on his neck. He was not eating and his owners could not get him to eat. On May 21, 2010, Kent Luftkin, CEO and President of 3rd Federal Bank visitied NGAP's new kennel facility and got the grand tour from NGAP director, David Wolf. Needless to say he was very impressed with the facility! When my wife learned that I was going to a one-day Greyhound Health and Wellness Conference at Ohio State University she asked if I really needed to go and what benefit I thought I would get out of it. This year's Greybowl was a change from the past, but everyone agreed it was more enjoyable. The basic idea was the same; sign up, get sponsors, meet with other adopters, bowl, and have fun. We always have fun! Ohio State University's Greyhound Health and Wellness Program has put out their new quarterly newsletter and this month the topic is hypothyroidism. They are stating a position that does not agree with that of the National Greyhound Adoption Program. Our position has been posted on our website in clear terms after more than fifteen years of using thyroid supplement and seeing the wonderful benefits so many dogs have gotten from its use. It was Saturday, October 11, 2008 and many of us from NGAP were in Dewey Beach, Delaware rejoicing. It was the first day of freedom for three greyhounds released from the Animal Medical Center where they had been held captive as blood donors for a long, LONG time. National Greyhound Adoption Program will be moving approximately 80 greyhounds from our old kennel facility which we have been using for the past seventeen years to our new state-of-the-art kennel facility that most humane societies could only wish for! This move will take place on Friday, October 16th. Check out our Dewey Beach events! Before the kennel existed and before the National Greyhound Adoption Program existed, we were known as the Delaware Valley Retired Racing Greyhound Association, commonly known as DVRRGA. We adopted greyhounds by flying them to Philadelphia and other destinations and we would meet adopters right at the airport. Occasionally, a few greyhounds would end up at my home. The island of Guam in the South Pacific ran a greyhound track for 32 years which closed in November of 2008. National Greyhound Adoption Program in Philadelphia, PA is drawing ever closer to moving into their new kennel facility. The current facility is comprised of trailers that were previously used as office trailers. The trailers have been converted into kennels using industry standard galvanized cages that are double-decked and on wheels. Ali Driben, a member of the Mainline Reform Temple, joined other members of her synagogue one Sunday to walk our greyhounds here at National Greyhound Adoption Program. She and her family enjoyed it so much that she decided to base her Bat Mitzvah project on something that would benefit the greyhounds of NGAP.